Take five things in your life that you can't live without. Choose wisely. I mean really. Think about what matters and what doesn't. Think about those things that make your day worth living. The things that get you up in the morning. And then, keep reading. I heard once, from someone far wiser than myself, that you need three things in life: something to do, someone to love, and something to look forward to. Three things? Are you serious? Is that really all you need? But then I thought about it. The things that get me going every day are not material. The first thought in my head is absolutely never "I cannot wait to put on my new dress today," or "wow, I'm ecstatic to use my iPhone." The first things I think about (okay, maybe after the first few minutes of self loathing and alarm directed anger) are the people I care about and the amazing (and countless) blessings in my life. But for me, it's really more than three things. It's five. Someone to love is just not enough for me. So I am breaking that one down. I need friends and a partner like I need air in my lungs. I need family (my mom, dad and sister) like I need the blood in my veins. So that's two right there. Something to do? Well, I need a job that has me feeling like I am making a difference. Something that drives me to be my best every single time I suit up and get out. And I don't just mean making it through the day. I want to make every day the best day. Beyond that, there needs to be a life outside of my job. I need interests outside of daily grind that are meaningful. To me, that's cooking, sports and seeing whatever I can soak in from wherever I am. So that right there is three and four. Lastly, I can agree I need something to look forward to. I am the ultimate planner. Just look at my calendar. Better yet, look at my father's, and you will see where I get it from. A blank day on my calendar means a blank day in my soul. Yes, I love relaxing and me time, but I get my energy from the zest of others. So seeing that I have an upcoming trip to Ireland and that I'm watching some of my best friends get married this year, or knowing that I will enjoy some delicious summer seafood on the Cape, or will hit up some summer festivals, that right there is enough for me. So take five things. And make them count. Because in five things you can have something great. If you don't have the time or energy to identify what those things are, let me give you an alternative: a pretzel crust, peanut butter frosting, rich caramel, honey roasted peanuts and a chocolate topping. Now go. 1. Preheat oven to 350, and spray a 9x13 pan with cooking spray. In large bowl combine crushed pretzels, melted butter and brown sugar. Stir to combine and press into prepared pan, packing tightly. Bake for 10-12 minutes until lightly golden. Cool completely. 2. In a large mixing bowl beat peanut butter and butter together until smooth. Slowly add in powdered sugar, beating until incorporated. We used about a cup and a half. Spread on top of cooled pretzel crust. Chill until ready to spread caramel. 3. In a medium heavy saucepan combine caramel pieces and heavy cream. Over a low heat, stir until melted and easy to pour. Let cool for a few minutes. 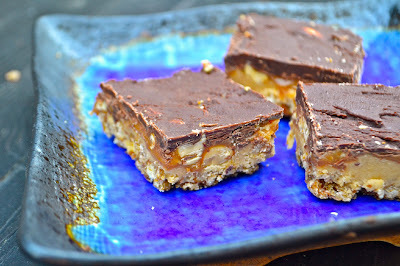 Stir in honey roasted peanuts and spread over the peanut butter layer. 4. Melt milk chocolate chips and heavy cream in a microwave until spreadable. Spread over caramel layer. Chill until ready to cut into squares.